reciperealities – Testing and Blogging about today's recipes for the home cook…. So we all have heard of “White” Chicken Chili and love all it’s cheesy, rich flavors but it’s the New Year and many of us are focusing on eating healthier. Here is where “Red” Chicken Chili comes in! It a super easy recipe, packed with protein and fiber that will leave you satisfied without all the extra calories and fat. The first time I prepared this, I did it on the stove top using a rotisserie chicken. However, you can also make this chili using the Instant Pot without pre-cooking your chicken. The key is to use both white and dark meat chicken for added flavor. If you are using your Instant Pot, you can even use FROZEN chicken! Wow! So for your convenience, I have provided directions for all 3 cooking methods. I hope you enjoy it as much as we did! Sauté jalapeño and shallots in the olive oil until softened (about 5-10 minutes). Add in garlic and sauté an additional 2 minutes. Place the chicken, UNCOOKED, and the remaining ingredients into the pot of the Instant Pot and stir to combine. Put the lid on the Instant Pot and lock it into position. Make sure the vent is in the sealing position. Set the Instant Pot to manual high pressure for 18 minutes (or the chili setting which will automatically be 18 minutes at high pressure). When the cook time is finished, let it naturally release for 10 minutes and then quick release any remaining pressure. Shred the chicken with two forks (either in the Instant Pot, or remove it to a cutting board to shred and then return it to the pot). Stir to combine. Sprinkle with cilantro and stir. Place the chicken, UNCOOKED, and the remaining ingredients in the crock of the slow cooker and stir to combine. If you’re making this chicken chili in the Instant Pot, you can use fresh or frozen chicken breasts. The cook time will stay the same regardless. If you’re making it in the slow cooker, use fresh or thawed chicken breasts for food safety reasons. 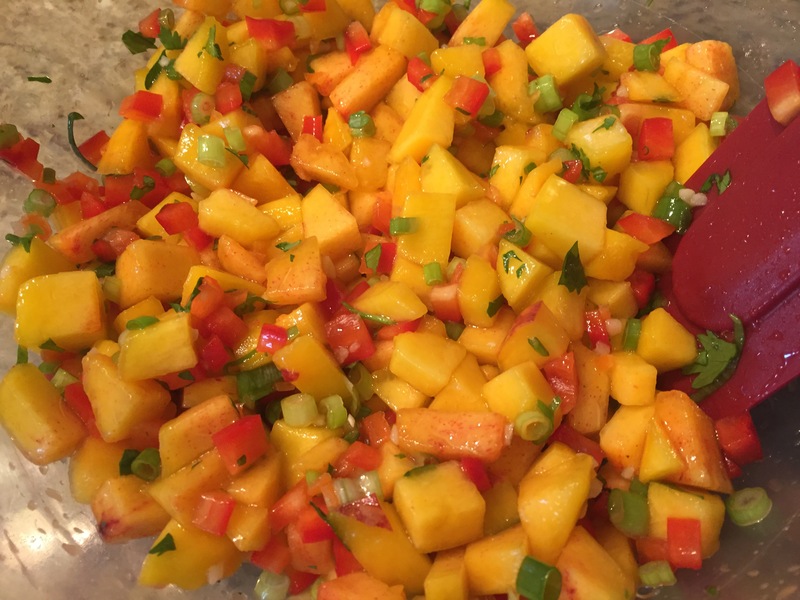 It’s the last official weekend of summer and if you are looking for a recipe to tantalize your taste buds this Labor Day, look no further than my Peach & Pepper Salsa! It goes great with so many of your Summer dishes and can make the most indulgent of dishes seem a little more healthy 😊. 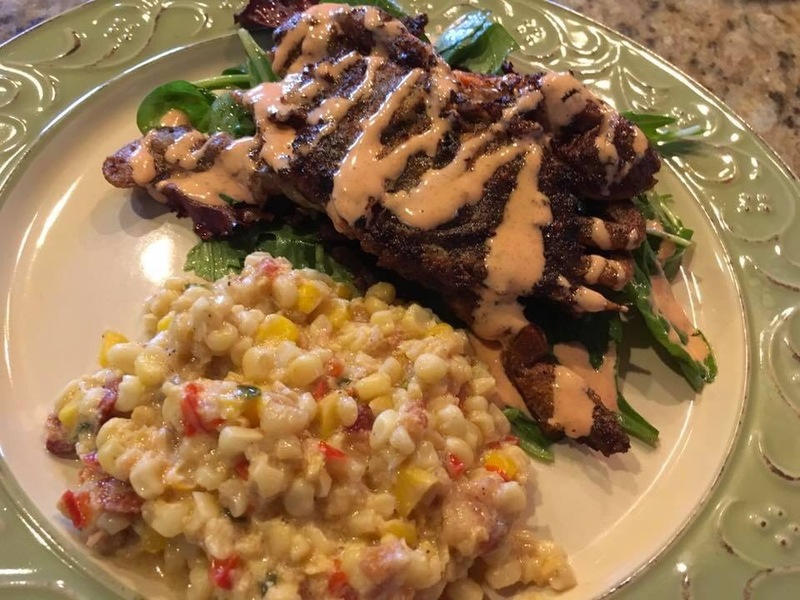 Last week, Jeff made my all-time favorite summer guilty pleasure…Fried Soft Shell Crab and Fried Corn. (Yes, you did see the word “Fried” twice and that is why in bathing suit season, the words “guilty pleasure” fits perfectly..!) To make it even more indulgent, I made a Sirracha Aioli to top the crab and a bed of mixed greens…so very good! We ended up with a couple of leftover crabs and I knew I didn’t want them to go to waste so I thought tacos would be a great alternative vehicle and that Peach & Pepper Salsa would be an excellent topping. 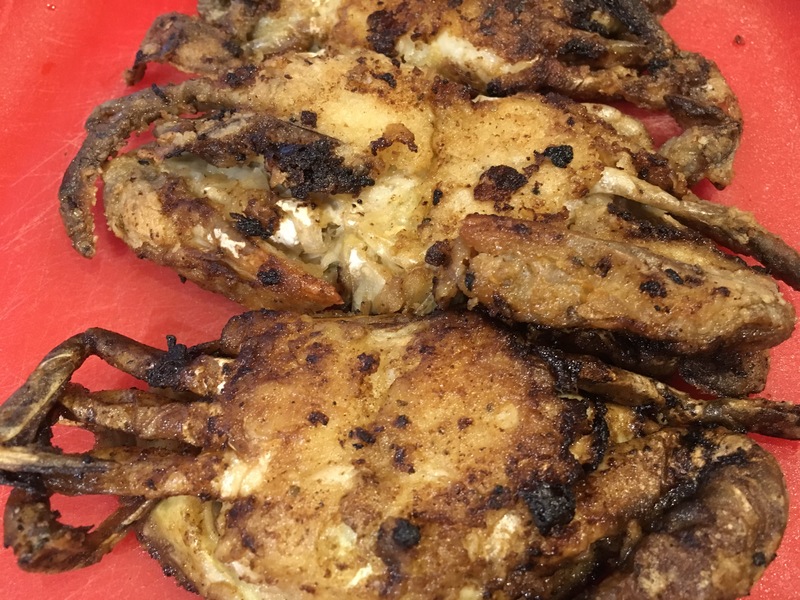 I warmed the crab up slowly in the oven on a cookie sheet with a rack to make sure that while it was heated, it maintained that crispy texture; then I chopped it up into bite size pieces to fill my tacos. 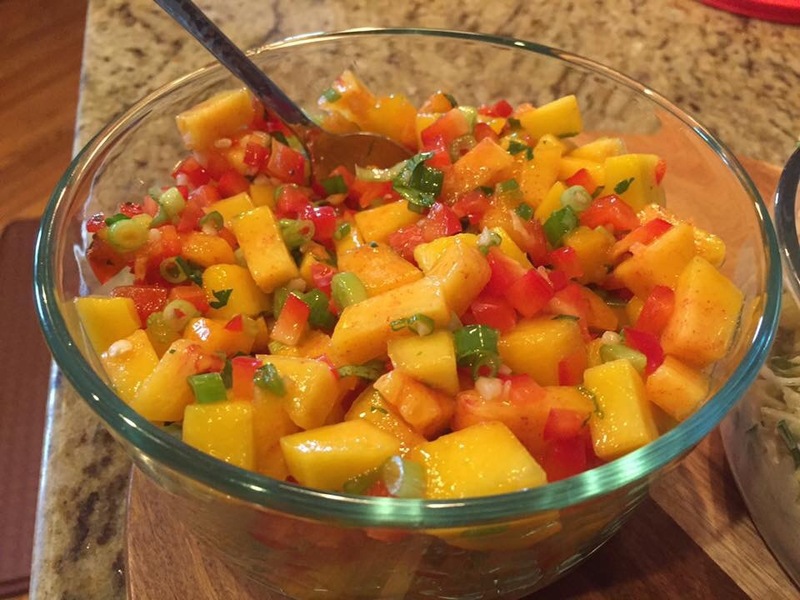 I topped it with the delicious Pepper & Peach Salsa and it took an already great dish to another level. The sweet juiciness of the peaches combined with the crunch of the red bell pepper and the spicy heat from the habanero was the perfect accompaniment for my Soft Shell Crab Tacos. This recipe is great as a stand alone salsa with your favorite tortilla chips. Another favorite way I like to serve it is over grilled fish like Halibut. There are just so many tasty ways to incorporate it and the recipe is soooo easy! Check it out! Combine all ingredients and mix well. Refrigerate for at least one hour before serving. This recipe is an easy way to elevate an every day dish into something a little more special and it can be used in so many way. You may even like it so much, that you just eat it by the spoonful straight out of the bowl! I hope you will try this recipe and let me know how you used it in your kitchen. Until next time, I’m Chef Frankie…Always in the kitchen, having fun and cooking with Wild Abandonment!